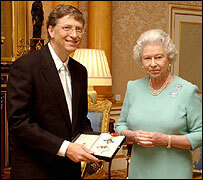 The king of computer software Bill Gates has received an honorary knighthood from the Queen. Mr Gates, 48, the world's wealthiest man, said it was "a great honour" to be recognised for his business skills and for his work on poverty reduction. The Queen had spoken to him about using computers, he said after a private audience with her. As an American citizen he cannot use the title "Sir" but will be entitled to put the letters KBE after his name. The entrepreneur was handed an insignia to make him a Knight Commander of the Order of the British Empire. He was joined at Buckingham Palace by wife Melinda. "It's not as natural [using computers] for the Queen as it is for young people," he said. "We talked about using computers, and the foundation, and about her travels and ours." The Bill and Melinda Gates Foundation is currently working on a global health programme in the developing world. Mrs Gates said: "We talked a lot about the developing world - it was very engaging." Before the private audience, Mr Gates met the Duke of Edinburgh, who is chancellor of Cambridge University, to talk about Microsoft Research Cambridge. The research laboratory is the first of its kind outside the US. Honorary awards to foreign nationals are conferred by the Queen on the advice of the foreign secretary. Jack Straw said he was "delighted" Mr Gates had been honoured. He added: "He is one of the most important global business leaders of this age." 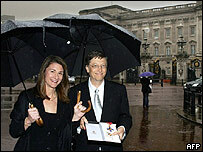 Mr Gates set up Microsoft in 1975 with his childhood friend Paul Allen, and by last year was worth an estimated £28bn. He and his wife, who have three children, are also known for their charitable work. As well as investing millions in research for an Aids vaccine, their foundation has also established a scholarship scheme to enable the brightest students to go to Cambridge University. But Microsoft has been convicted of anti-competitive behaviour in the USA and is being investigated in Europe. Other Americans who have received the KBE include former president George Bush Senior, former Mayor of New York Rudolph Giuliani and film director Steven Spielberg.